My girls LOVE chicken fingers! I used to buy a big bag of frozen chicken nuggets / chicken fingers but now have found this tasty recipe! Better yet, my girls love them! 1. Preheat the over to 400 degrees. Spray your pan with cooking spray. 2. Cut each of the chicken breasts into long strips, creating "fingers." I prefer to buy tenderloins and skip this step! 3. Place chicken in a bowl and add oil. Coat breasts thoroughly. 4. In a separate bowl, stir together bread crumbs, Parmesan cheese, oregano, chili powder, salt and pepper. 5. Add bread crumb mixture to chicken and mix to coat thoroughly. You could even place the chicken and bread crumb mixture in a Ziploc bag and shake. 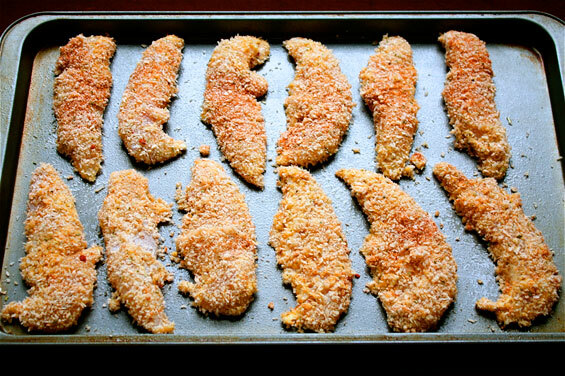 Once all chicken is coated, arrange them on your baking sheet. 6. Bake for approximate 10-12 minutes, then turn each finger over and bake for an additional 10 minutes. Cook until they are browned and cooked through. I like to serve these with homemade sweet potato fries! Cut up sweet potatoes length wise into steak fry strips. Place them in a Ziplock bag. Add some Extra Virgin Olive Oil and Season Salt. Close and shake the bag. Lay the fries on a baking sheet and cook until crispy (about 25-30 minutes)!